City's first e-toilets, also referred to as smart toilets, will be thrown open to the public soon. Two units have been set up and will be ready for use once underground drainage connectivity and the electricity connection are ready. 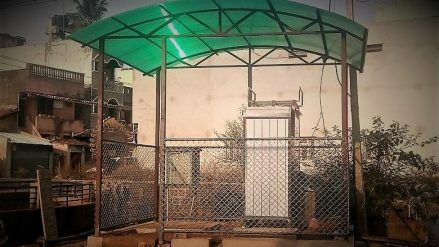 An e-toilet is a modular, prefabricated public toilet made of steel and has user-friendly electronic interfaces to ensure cleanliness and hygiene to every user. The unmanned, automated unit has remote monitoring capabilities and its status can be tracked over the internet. These toilets incorporate full-cycle approach in sustainable sanitation by integrating electrical, mechanical and web-mobile technologies. They control entry, usage, cleaning, and remote monitoring capabilities with multiple revenue options. The e-toilet is easy to install, consumes less water and is power efficient. It ensures cleanliness through auto flushes and floor washing. The operations are unmanned and coin operated or free access can be allowed. It’ll facilitate onsite waste treatment using anaerobic biodegradation. There’s no need for regular manual cleaning or maintenance. Outdoor advertising space on e-toilet panels will generate income for the Corporation. e-Toilets can be connected over a GPRS network which ensures real-time monitoring of the usage and health status of e-toilets. This can be viewed and managed over a web interface for ensuring minimal downtime and standardized maintenance operations.